Sullen Germans watch two tanks - a Renault FT-17 Char a Canon (Tank armed with a 37mm cannon, foreground) and a Char Mitrailleur (tank armed with a 8mm machine gun, background) accompanied by poilus (literally "hairy one" - French soldiers) occupy a German town in the Rhineland. The French and their Belgian allies took this step to secure the German coal so they could smelt French iron ore after a breakdown in discussions over the high cost of World War I reparations madated under the Versailles Treaty that were crippling the German economy and causing runaway inflation. France and Belgium claimed they were authorized under the Versailles Treaty to occupy the Rhineland if Germany failed to pay. Both the United States and Britain claimed not to support the occupation, but only the American contingent was pulled out. French soldiers occupied the Rhineland until 1930. Hitler remilitarized the Rhineland on March 6, 1936, in a move that was unopposed by the French and British and gave him confidence to move on other territories. 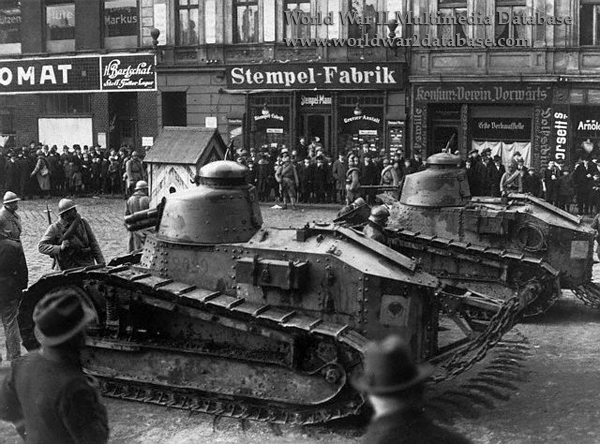 The FT-17 was the most widely produced tank of World War I, and some 1600 examples were still available to the French at the start of World War II. After the Fall of France, the Germans used them as second-line garrison duty vehicles or snowplows. Some FT-17 tank turrets were used in static defenses along Norway, the Atlantic Wall, and the Channel islands.